The American electorate is getting ready for the next presidential elections and digital campaigns play a big role in this race. However it is not as easy as it sounds to manage a digital campaign throughout an election. The US presidential election carried out every four years, takes the lead in world political campaigns as well as advertising world. Political communications experts throughout the world watch the campaigns, comment on new developments and bring forward their own perspective to the new trends and tools of digital activism. Current president Barack Obama became the first one to not resist the power of digital campaigns in 2008 and managed to reach the younger generations in the US. Through his Facebook campaign, he convinced many new voters to register and actually vote for him. This paved his road to the White House. The upcoming elections now see a competition of campaigns on the internet from both sides, and president’s rival is Mitt Romney of the Republican Party. There are few days left to the elections and both parties continue to support their campaigns with full dedication. They use digital activism and campaign tools such as online ads, mini blogs, live blogs, status updates, videologs. Although conventional communicational devices such as print and TV ads still reach out to millions, the impact of digital ads are at a level that cannot be ignored. Both candidates use all these opportunities to convince their electorate till the morning of the elections. The new trend in consolidated democracies seems to be to encourage more people to participate in elections as fewer people vote today compared to some decades ago. The reason for non-participation varies from disbelief in the system to simply being content with it. However there is no consensus on the reason why the citizens do not register and later on cannot vote. President Obama’s campaign in 2008 focused on convincing the college students to register for elections and vote for him. In 2012 elections, both parties suggest their electorate to register and actually show up for the ballot on the Election Day. It has reached to such levels that, today in the US a voter can carry out all election procedure in digital atmosphere, except for casting the actual vote. How do Candidates use Digital Platforms? Both the Republican and Democratic parties primarily focus on making their electoral promises heard by more people. Parties strategically prepare the content accordingly with their policy proposals and electoral promises, then share them on live blogs and micro-blogs simultaneously in prime times of social media, and have key people share them with their followers. By doing so, parties aim to have full penetration to their electorate with all the campaign material. With the help of the shared material, voter determination and popularity of the candidate are clinched. The candidates get closer to the White House step by step with each vote they gain on the way. However, the support rapidly gained on social media can be lost with the same pace too. It is possible to refer to the upcoming elections with the quote “They will leave as they came,” as it is hard to sustain voter loyalty when it comes to digital campaigns. Because once a voter is convinced and made up his mind whom to vote, he gets targeted by counter-propaganda to change his mind again. The campaign-squads keep feeding new material to the convinced voters in highly personalized election race. When the digital feed is inadequate, followers of the campaign –and thus the voters- are lost to the other side. In order to sustain loyal support of the voters, campaign executives prepare feed schedules to guarantee their campaign’s success. As in all other platforms, digital campaigns cannot be preserved as a field of fair play and kindness. It is highly expectable to witness actions that the candidates cannot dare to but their fanatic supporters can. Among such behavior can be listed the personal records and information from a darker period of personal history of the candidates. The fanatic supporters tend to focus on personalized material and gossips about the candidates, turn them into really hot topics of sensational information for the social media and unleash the rumors. The mistakes that candidates make during their campaigns such as a misguided definition or utterance of no-no phrases are also taken up by such supporters and released to digital platforms very quickly. For that reason the campaign squads need to be uber-careful on how their candidate is speaking, acting in front of cameras or in presence of microphones. It took only minutes for Obama supporters to prepare tons of material about “binders full of women�? phrase, similarly Romney fans took upon Obama’s “explosion�? graphic from the debates. There is no need to repeat the fact that such striking material is more popular than simple electoral promises among social media users. 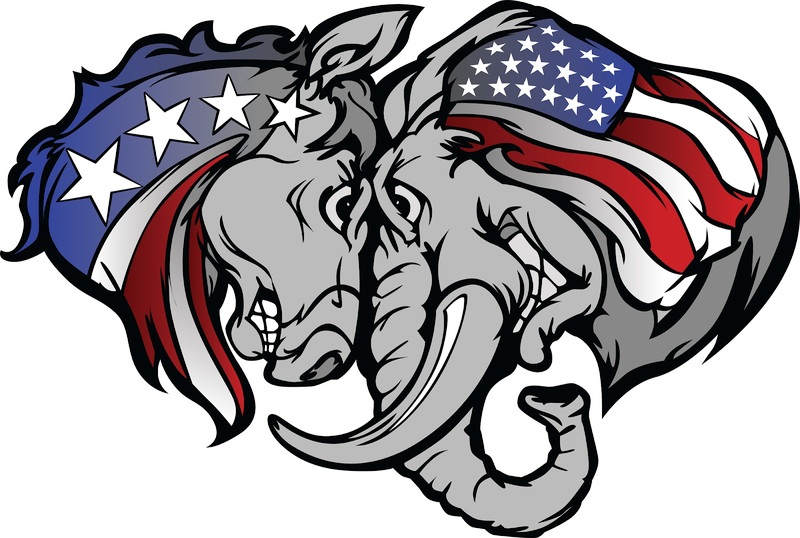 The Republican Party with the emblem of the elephant gives out the message that they have an elephant’s memory and traditions will be carried on with slow but sure steps. However this does not really go in line with the rapidly changing world of digital campaigns and the Republican Party seems to be lagging behind when it comes to competitiveness on the internet. The content prepared by the Republican side is far below necessary and the sharing frequency by officials is not at satisfactory levels. However, it is coherent with Republican Party’s history when it comes to adapting to new technological platforms. Whenever there have been new technological communications platform becoming available, the Republican candidates take it on slowly but with sure steps; such as radio or TV in 20th century. For that reason the social media still awaits a Republican revitalization. On the other hand, the donkey symbol of the Democratic Party shows how persistent they can be when it comes to adopting newly invented communicational tools, and with the liberal approach to newly emerging trends they seem to be gaining many votes especially from the youth. Currently the Democrats seem to have gained a great momentum in command of digital campaigns. They share pre-prepared material on strategically decided hours and they keep feeding new material to their electorate, get feedback and plan coming steps according to the data they collect. Compared to the Republican campaigners who use social media platforms rarely during the day, the Democratic Party’s dedicated and organized squad not only gets more followers but also follows their supporters to better understand their needs and wants. The key in preparing the digital campaigns in an election is to better understand those who will vote and prepare the campaign accordingly. One can refer to digital tools as the basic need for freedom of speech in our day, and it is most obvious for its agenda-setting quality. Use of digital is an agenda topic by itself already, yet moreover it is an important tool to decide real-agenda by looking at the trending topics and salience among the electorate. Political groups and parties can decide which policy to focus on, or which side to take based on the feedback from their electorate. In this sense, digital estimates are highly regarded by political pundits today. Especially the tweets and micro-blog posts about the recent economic crisis are pooled into a database by many political advisors from both parties and made use of for the digital campaigns. The youth that complains the most about the economic crisis, tends to be lured into political debated through references to their personal opinions by the candidates. The election period is taking place in a very digital atmosphere, but it is not the end to put the ballot into the box. Digital life continues after the election and no matter who wins, there will be real time vote counting and leader-promotion online. The entire world will be watching the vote count second-by-second, and no one will want to miss even the counting of one vote. When the clocks strike the end of voting hour in the US on the 6th of November, citizens of the US will be seeing the results of local, regional and national shares. Not only will the American citizens and presidential candidates but also global lovers of America be watching the results live. Thanks to the American missions all around the world, this event will also turn into an opportunity to re-sell American image to the global youth, as it will definitely be a trending topic and a reason to celebrate in many parts of the world at and around the consular bodies. Surely there will be live-tweeting and geo-tagging events at the election mornings around the world of Americophile groups. This entry was posted in Digital, Evaluation, Social Media, USA. Bookmark the permalink.